No article series about Southeast Asia would be complete without at least a passing mention of Angkor Wat. This impressive temple is one of the most popular travel destinations in the world, and certainly tops the list of favorite destinations for most travelers in Southeast Asia. Here, in the penultimate article of my ecotourism series, we finally get a chance to talk about this awesome destination, and how to make the most ecoconcious decision possible when travelling from ruin to ruin! Before we talk about the ecotourism side of Angkor Wat, it’s best to give a bit of a summary of the destination for readers who may not be familiar. 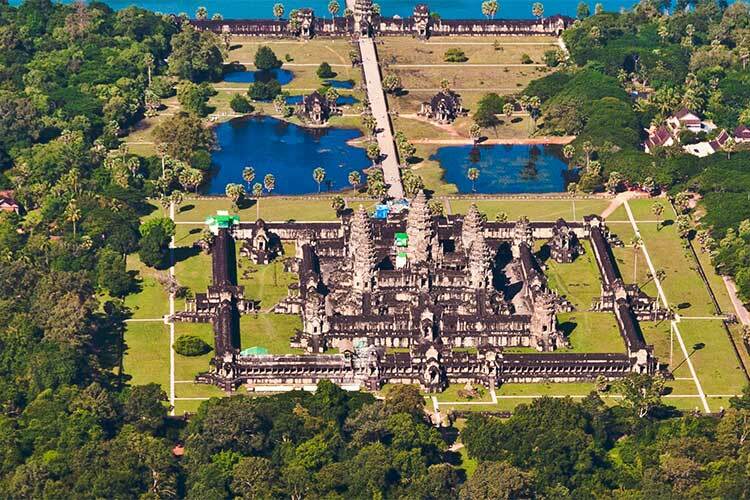 Angkor Wat is an enormous compilation of temples, palaces, and other ancient buildings constructed in the 12th century by the Angkor civilization. Widely considered one of the most scientifically and culturally advanced ancient civilizations of Asia, the Angkor people took great pride in coating their buildings in elaborate sculptures, wall murals, and other decorations. 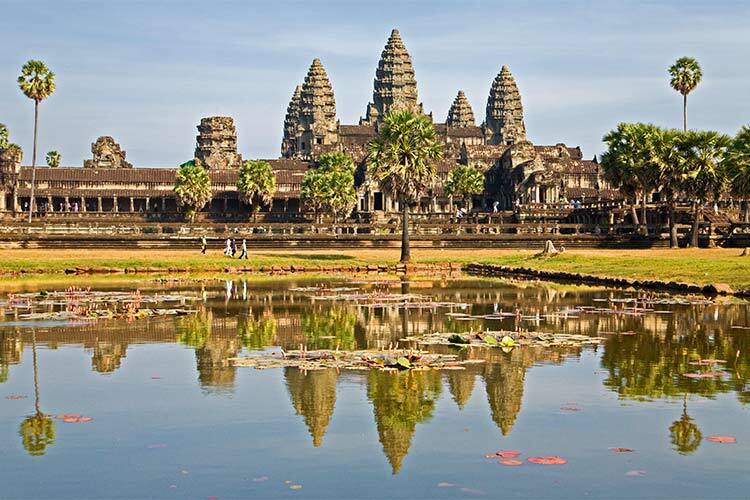 Their handiwork, as well the highly preserved state and enormous size of most of Angkor Wat, usually earns it a place among the list of ancient wonders of the world. 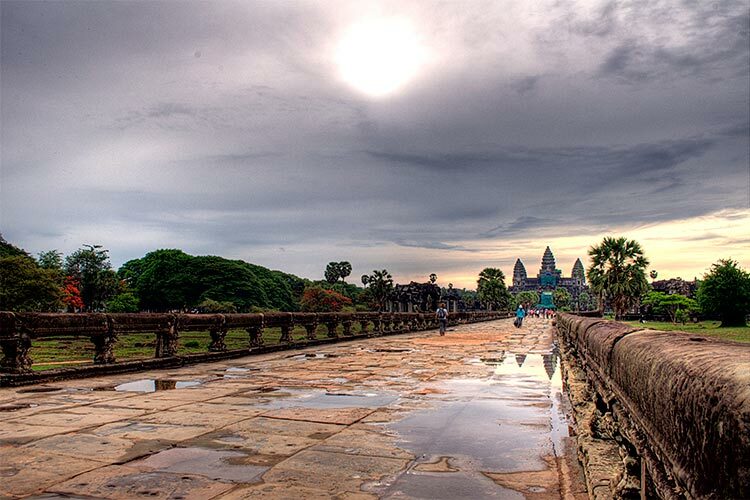 Angkor Wat, like many of the Angkor ruins, are found in Cambodia. 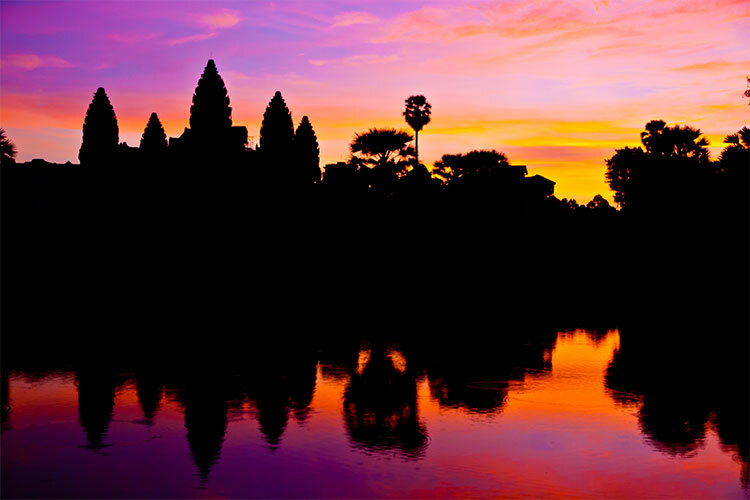 Angkor Wat itself is located a few kilometers north of the city of Siem Reap, in western Cambodia. 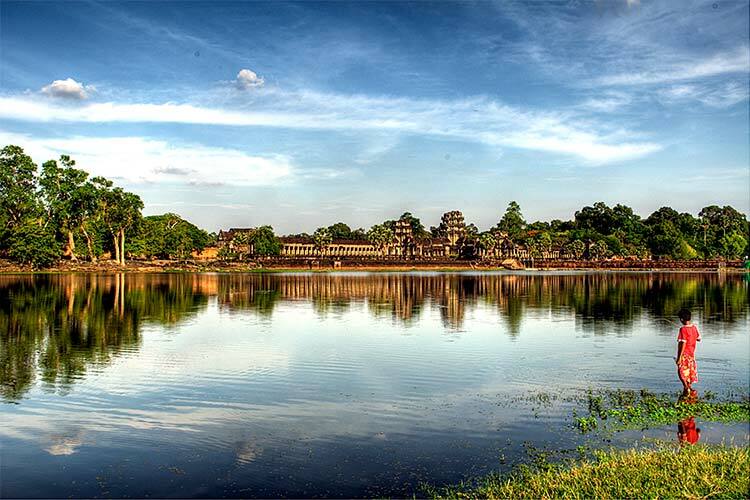 The featured building is the eponymous temple Angkor Wat. The five peaked structure is the largest religious structure in the world and the de facto symbol of Cambodia. North of Angkor Wat sits Angkor Thom, the ancient city associated with Angkor Wat. Sadly, this city was mostly built of wood, and thus disappeared long ago. The city’s temples, some storehouses, and the royal palace, however, were made from stone, and still stand today. 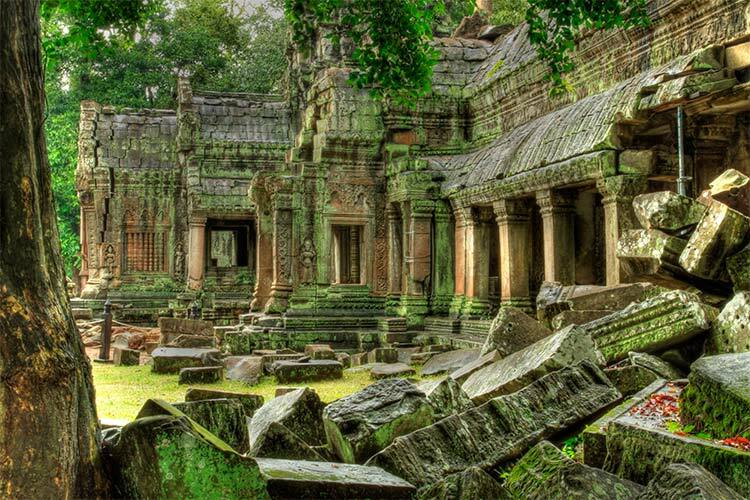 Outside of Angkor Thom sits two dozen or so other temples, including the famous Jungle Temple. Altogether, Angkor Wat, Angkor Thom and the other temples take up an enormous portion of land, which is why it’s necessary to rent or hire some kind of transportation. Fortunately, there’s a number of different ways to get around. Unfortunately, not all of them are eco-friendly. Here’s a few tips on minimizing your carbon footprint while maximizing the number of ruins you get to see. One of the most popular ways to get around Angkor Wat is by bicycle. There are dozens of companies renting out street bikes and mountain bikes in Siem Reap, as well as almost every hotel or guesthouse. Finding bikes in this town is no problem. Expect to pay between $1 and $7 per day, depending on the quality of the bike, how long you’re renting it for, and how skilled you are at haggling (don’t ever take the first price they offer). Bikes should come with a bike lock, but rarely come with a helmet. Bicycling is an enjoyable way to get around the temples, provided you’re in decently good shape. The area around Angkor Wat is strikingly flat and decently shaded, so the ride is pretty easy. The biggest obstacle to overcome is the heat, which can be quite unbearable at any point in the year. Regardless, biking is an enjoyable, cheap, and extremely eco friendly way of getting around Angkor Wat. If you’re not in great shape or want to go a little faster, you’ll be pleased to know that electric bikes are now available from a handful of shops in Siem Reap. Rentals seem to start at $10 per day, but you may be able to talk them down to $7 or so. The electric bikes are essentially a combination of a motor bike and a standard bicycle. They still have pedals and can run entirely on manual power, but they’re also equipped with a small electric motor that you can throttle in a similar manner to a standard electric motorbike. When using the engine, you don’t go quite as fast as a gas powered motorbike, but definitely a good deal faster than you could pedal. The electric bikes are a unique and enjoyable way to get around Angkor Wat without having to work too hard or damage the environment too much. There’s not much to say about motorbikes that hasn’t already been said in the electric bike section. They’re a bit worse for the environment, but still not too horrible. Motorbikes can be rented from a huge number of sources in town, with prices from $6 to $20 per day depending on the type of bike, length of rent, and negotiation skills. A standard automatic 125cc scooter is perfectly fine for exploring Angkor Wat; there’s no reason to get the big bikes or dirt bikes that some sellers will try to push on you unless you’re planning on going down the small jungle footpaths. It should come as no surprise that tuk-tuks aren’t eco friendly, considering they have a reputation for belching black smoke all over the road. However, considering the ubiquity and aggressive marketing tactics of these interesting little vehicles, it’s inevitable that some tourists will want to take them. Prices for a tuk-tuk can vary wildly and depend almost entirely on the length of your trip, the integrity of your driver, and whether or not you know how much a local person pays for the trip. If you have to take a tuk-tuk, be sure to share it with other tourists. Besides splitting the cost, this also helps to reduce the carbon emissions from these inefficient machines. If you book a tour of Angkor Wat through a tour agency, or stay at the right hotel, you might be able to take advantage of a shuttle service between Angkor Wat and Siem Reap. This is a great way to save money and be ecoconcious, but has one major downside – getting from temple to temple. 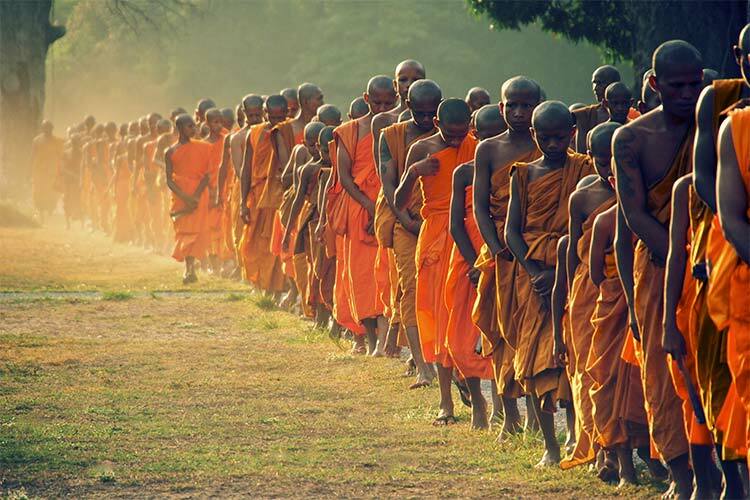 You’ll likely have to hire a tuk-tuk or a motorbike taxi to get around, since the walk can be quite a long ways. Of course, if you booked a full days tour, you won’t have to worry about this. Just enjoy the tour! This is probably the most expensive, most comfortable, but least eco-friendly option available. If you have the cash and want to rent a car, ask your hotel receptionist. They’ll know where to get you one for a competitive price. Most of the major temples have free parking lots out front. Taxis are a bit rare in Siem Reap. It would be difficult to find one on the streets, but some companies do exist, you just need to call ahead and reserve one for the day.